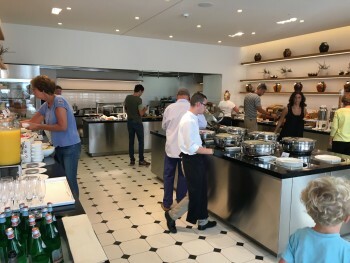 This is the second part of my review of the JW Marriott hotel in Venice. Part 1, which covers the location, rooms, kids club and pool, can be found here. 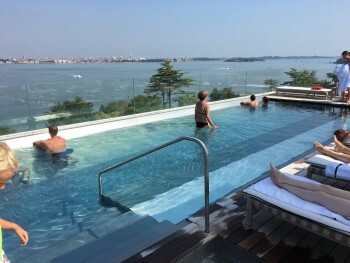 The JW Marriott Venice roof terrace in the main building is the most successful part of the hotel. But, yet again, they score an own goal. After May, at which point the hotel believes that the main pool is warm enough for kids, children are banned from this pool. Yes, kids are banned from a pool that is about 2 feet deep and are forced into the ‘family’ pool which is about 5 feet deep. There used to a restaurant and bar on the roof. The wasp invasion has basically forced them to abandon this now. A new bar has been built inside the restaurant and everyone now eats inside. I have to say that the meal we had here was the most accomplished I had in over two weeks in Italy. But … come on …. the hotels adds an €8 per person ‘cover charge’ to your bill and doesn’t even provide any bread. And, when your bill comes, you are asked to tick a box for an extra tip (service is included) with the options running to 18% ….. There is a lot to see on the island and, to be fair, we didn’t experience it all because of the children. Dispensa is the hotel cafe. Here is one improvement over previous years. 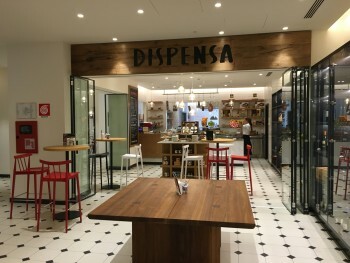 Dispensa used to open very late to effectively force you to pay for the €35 hotel restaurant breakfast. It now opens at 6.30am so if you can survive on a coffee and a pastry then you can make a decent saving here. Breakfast in the restaurant is OK although it is certainly not outstanding. It is what you’d expect from a four star hotel. Yet again, they manage to annoy you. Once you have sat down, a member of staff comes along and places a card and pencil on your table. The card says “Room number: [filled in for you]” and underneath “Tip: [left blank for you to fill in]”. I mean …. I popped into the JW Marriott Venice spa briefly. It is classy but expensive and I wouldn’t be surprised if it was the best option in the city. It has a small indoor and outdoor plunge pool which looks good. Entrance is €35. 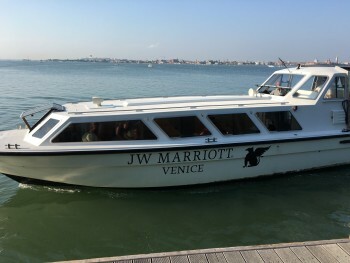 The JW Marriott Venice hotel shuttle boat runs every 30 minutes without a break until after midnight. I had a look at the timetables for the Kempinski and the Excelsior hotels and they run a worse schedule. The boats have a capacity of around 35 but were never full. We went to the opera one evening and were grateful for the late finishing time. Venice is a great place to come in August. You don’t need to spend much time in the centre with the cruise ship crowds. You can happily pass your days at the JW Marriott or take a taxi across to the Lido where the beach is impressive, and then pop into the city for a couple of hours in the early evening when it quietens down. There are a lot of things about the JW Marriott Venice I like. The design and furnishings are very well done – this is probably the thing that swings it for me. The grounds are large and well tendered. The rooftop bar and restaurant is cool. The spa looks great and there is a fine dining option. The Junior Suites work really well, either for a couple or for a family with two children. The shuttle service to St Marks was always punctual. Breakfast isn’t bad. It just falls down around the edges. Spurious extra charges. Demands for ludicrous tips. €11 for a can of coke by the pool. The wasp infestation. The lack of upgrades for status members. €118 to rent a bike for 10 minutes. €8 restaurant cover charges which don’t even get you any bread. 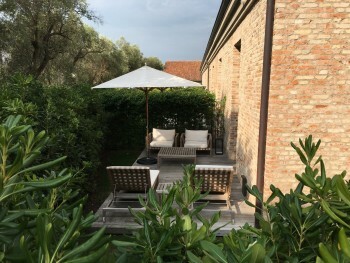 For 40,000 Marriott Rewards points (now 50,000 points, and to be 60,000 points on peak nights from 2019) plus €200 per night for a €500+ junior suite, the JW Marriott in Venice was a very good deal. 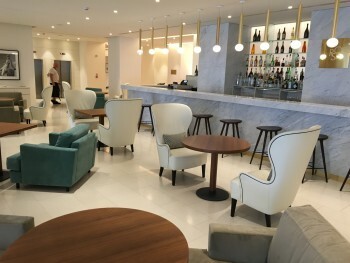 I doubt I would come back and pay full price – I would like to try the Cipriani or Kempinski, and the Excelsior on the Lido should be good when refurbished – but it is a good points option. PS. We had lunch on the Grand Canal-side terrace at Marriott’s Gritti Palace one day. I do recommend this. It gives you an excuse to have a poke around the astonishing interior of the Gritti and, on a sunny day with the hotel’s Riva speedboat parked up next to your table, it is a lovely place to eat. It clearly isn’t cheap but the food is not too fancy and you are a world away from the crowds. I’d like to visit Venice but would probably do it in the winter months. I see they are moving to the American model of tipping – I noticed this summer that they’ve now started calculating it for you on your bill! I don’t mind tipping in America because the food is plentiful and reasonably priced; when we move onto GCM however, eating out is very expensive, a 15% service charge is automatically included and they still have a space for you to add a tip! Also, they sneakily charge in Cayman dollars which are worth more than the US $ (if you’re British, you just have to remember that a Cayman dollar is worth 95p – £1 depending on the exchange rate). Sounds like the hotel is the biggest wasp of the lot. I think the last vestige of anything nice about Venice disappeared sometime in the 90s. I’m just so glad I did it all back then? You went to the opera? I thought La Fenice went on holiday in the summer. Maybe it was a guest show. No, it reopens in the last week of August. We missed it last year because we were a week earlier and they were shut. There is a lot to like about Venice if you avoid the core central area. 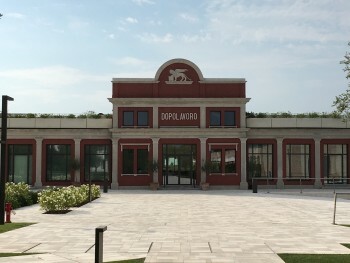 The lido is basically the emptiest Italian beach resort I know, you can go the opera, you can stay and visit some exquisite hotels, you have the Peggy Guggenheim museum, Murano / Burano, Ca’Rezzonico (which I didn’t know about until this year) …. Got to say that like Rob I always enjoyed Venice with family when the kids were younger. Stayed on the Lido at Des Baines (Death in Venice and now an apartment development project) and the Excelsior. Both used to be Starwood (SPG) properties. Also stayed at The Hilton Giudecca when it first opened. The 12 Euro coke was a common feature to them all, but you could also pop (excuse the pun) outside and pick up vital supplies at nearby convenience stores around the corner from all of them. The lido was a beach holiday from the Nineteen Twenties (sans prices!) and it was great to spend a day in a cabana and then as the temperatures cooled down, take the free boat shuttles to St Marks square. August was a great time in Venice. I would recommend the Lido and there are still some (only mildly eye watering) deals to be found at the Excelsior which include the excellent breakfast with prosecco. A good swimming pool and a long sandy beach with gently sloping shores. I stayed at the Gritti about 15 years ago when Westin ran the Excelsior. They had a private speedboat (still branded Ciga I remember) which shuttled guests, for free, between the Gritti, Danieli and Excelsior. Now that was fun, shuttling around the lagoon in that boat. Appreciate no kids club but when I was last in Venice (during a conference, so hotel rates even more extortionate than usual!) I had a fabulous Airbnb apartment – 5 min walk from St Mark’s and supermarket only a 10 min walk away.